This quality wirebound journal features a flexible and durable imitation leather cover displaying an inspirational message in foil lettering. 160 lined gilt-edged pages. 21.4 x 14.9cm. 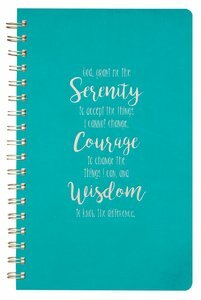 About "Spiral Journal, Serenity Prayer, Luxleather"
:Serenity, courage and wisdom are invaluable qualities for the trials we daily face. The Serenity Prayer journal is a great place to write out prayers to God, record precious Scripture passages, or journal in times of trouble. The encouraging quote on the front teal cover, printed in bronze foil lettering, reminds you to shift your focus to God who holds all our circumstances in His sovereign hand. This encouraging spiral journal is a great graduation or birthday gift for a young woman entering a new season of life. Customer Reviews For "Spiral Journal, Serenity Prayer, Luxleather"
The photo of this journal on the website does not do justice to how soft the feel of the cover is, or how great the gold rings, embossing and page edges look on the teal cover. I've just purchased this in store and I'm very excited to say that it will be my new prayer journal! Good sturdy pages, gorgeous notebook. Highly recommend.